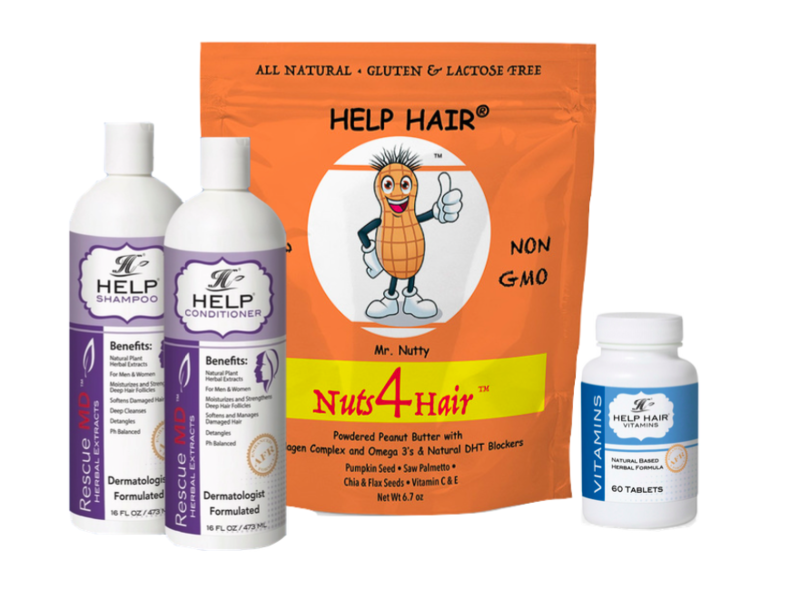 Nuts4Hair Combo Pack- Free shipping Includes: 1 Pouch- Nuts4Hair®- Collagen Complex, Natural DHT Blockers- Pumpkin Seed, Saw Palmetto, Omega 3's- Chia & Flax Seed, Vit(s) E,C in Delicious Peanut Butter Powder (30 servings) Plus 1 bottle of Help® Shampoo- Rescue MD™(16 oz) - Natural Plant Herbal Extract. Moisturizes and Strengthens. Deep Cleanses. SLS and Paraben Plus 1 bottle of Help® Conditioner- Rescue MD™(16 oz) - Natural Plant Herbal Extract. Moisturizes and Strengthens, Softens and Manages, Detangles, Ph Balanced. Plus 1 Bottle of Help Hair® Vitamins- 60 Tabs. Doctor Formulated and Recommended by Worldwide Hair Clinics! DR OSEITUTU MADE ME A BIG FAN! I am an African American woman with hair loss called CCCA. My dermatologist, Dr OseiTutu told me to use the shakes, vitamins and the Nuts4Hair. Within 4 months most of the patches on my head have filled in and my hair stopped shedding with less breakage. Now at 8 months my hair is stronger, thicker, and shinier and the rest of the patches including the hair line filled in. This was all without surgery! I added the RescueMD shampoo and Conditioner which helped with the breakage and made my hair less damaged because my hair is so damaged from relaxers. The Help Hair Products are a miracle! The Help Hair Products are a miracle! I went to my Dermatologist. Dr Brent Mizelle told me to use a combination of Shakes, Help Hair Vitamins and Rescue MD Shampoos and conditioners. I read online and added the Nuts4Hair. Within 4 weeks I had immediate improvement. First my hair stopped shedding and then it grew faster and thicker. Now at 5 months my hair loss completely stopped and best of all it was easy to take. I use the shake daily with the Nuts4hair and take the vitamin later. The shampoo and conditioner smell great. I plan on staying on the products since they are very effective and affordable. Love Nuts4Hair and the vitamins with shampoo and conditioner gave me great looking hair!!! MR NUTTY COMBO PACK IS THE BEST COMBO FOR ME! my receded hairline has filled in. I use the Rescue MD shampoo and Conditioner 3x a week and this combination has been working for me and is extremely easy to use. I like the fact there is free shipping. Have seen amazing results especially with Help hair vitamins and Help Shampoo and Conditioner. I take 1 tbsp as directed daily of Nuts4Hair with Help Hair vitamins 1 tablet 2x daily. My hair loss has reversed. My bald spots are filling in! Dr Osei-Tutu told me to take this products and I love it. I use it with the Help Rescue MD shampoo and conditioner which not only strengthen my hair but makes my frizzy hair really manageable. The scent makes my hair smell great. Dr Jerry Cooley recommended Help Hair products! Dr Jerry Cooley recommended Help Hair products to me when I visited him all the way from Alabama. Here is a link to a youtube video that I found before I scheduled my appointment https://www.youtube.com/watch?v=19HoiOlVbLA. I was losing my hair and I wanted to go to the best hair loss doctor. His credentials are excellent so it was worth traveling. He was past President of the Hair Restoration Society and a Board Certified Dermatologist. He told me it was too soon for a hair transplant and he suggested I try the Help Hair Shake and vitamins and even use the their shampoos and conditioners. I started with the shake and vitamins daily and after a few months I knew I was on the right track. Next I added the Rescue MD shampoo and conditioner. My hair is so much thicker and it stopped falling out and the hair line and bald spot in the back filled in.I did not want to use finasteride because of the side effects so I added the Nuts4Hair which has natural DHT blockers. The taste of the shake and the Nuts4Hair is really good and I look forward to taking it everyday. I am so happy and Dr Cooley really gave me good advice. He said this is the only product that works for hair. And he has tried them all! Nuts4Hair®- Collagen Complex, Natural DHT Blockers- Pumpkin Seed, Saw Palmetto, Omega 3's- Chia & Flax Seed, Vit(s) E,C in Delicious Peanut Butter Powder (30 servings) Free shipping with case (5 pouches). Help® Shampoo- Rescue MD™(16 oz) - Natural Plant Herbal Extract. Moisturizes and Strengthens. Deep Cleanses. SLS and Paraben Free. Help Hair® Vitamins- 60 Tabs. Doctor Formulated and Recommended by Worldwide Hair Clinics! Help Hair® Shake (30 servings 2.1 lbs.) Doctor Formulated and Recommended by Worldwide Hair Clinics! Click the button below to add the Mr. Nutty Combo Pack- Nuts4Hair (30 servings), Help Shampoo, Help Conditioner, Help Hair Vitamins with Free Shipping to your wish list.